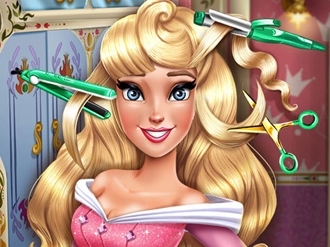 Princess Sofia The First wants a new haircut and she has come to you for help, because you are the best hairdresser in town. Sofia wants a real princess hairstyle, so think about elegance and glamour, but at the same time be aware of her young age and let her hair reflect her beautiful youth. The sweetest baby mermaid in the undersea kingdom loves hairstyling and decided to get a new haircut. 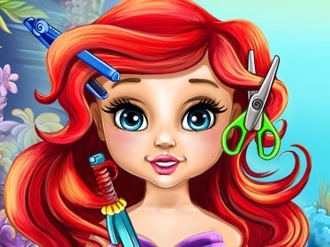 Comb, cut and curl baby Ariel's red hair with kids salon tools, then discover her wonderful collection of colorful sea hairpins. She may be a kid, but she is still a princess and looks are just as important to her. Finish the hairdo with lots of glitter and go through her wardrobe to pick up the most beautiful princess outfit. Fancy mini mermaid tops, fishtails and a pair of cool glasses will complete the look and will make the baby shine in her kingdom. 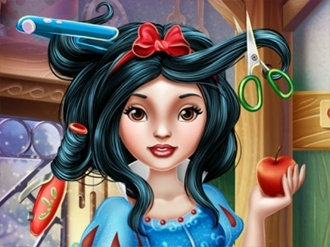 Snow White is known to be the „Fairest of Them All”, but now she feels that it`s time to get a new haircut, will you help her? Be the princess`s hairdresser and create an enchanting coiffure in a professional studio equipped with all the needed tools. Trim, curl and dye her black hair in a variety of beautiful colors. Finish the hairdo with cute accessories and pick a glamorous outfit to go with her new hairstyle! Princess Belle is preparing for her first date with the prince. She needs a new hairdo. Could you help her to design a new hairstyle? After that, you could go ahead and do her makeup and choose a beautiful dress as well.